Top 5 ways to avoid gender stereotyping young girls. When I was young, I can remember going to the playground to play basketball with my brother. I loved playing basketball, in fact, I enjoyed most sports. One day when my brother and I were playing basketball, two boys approached my brother to ask if we wanted to play against them. One of them said (to my brother), “Do you and your little brother want to play against us?” My brother and I looked at each other and then back at the boys and said, “Sure”. I don’t think we ever corrected them – never said, actually I am his sister…that’s right, a girl who happens to play basketball! It just seemed easier in that moment to be a boy. That way I didn’t have to explain myself or listen to boys joke about how they “lost to a girl”. I could just be one of the guys. Looking back, it was not that I identified more with boys than girls. I loved being a girl…still do. It was just that I didn’t like the things that girls were “suppose to” like. I remember getting Barbie dolls and then pretending to blow them up with my brother’s G.I. Joe figurines. I didn’t like to wear dresses or have my hair done. At recess all the boys would be playing “wall ball” (a game where you hit a tennis ball against the wall with your hand) and the girls would usually just watch them play – or jump with skipping ropes. I wanted to play wall ball – that seemed like a lot more fun than just sitting on the side lines. Boys always seemed to be having more fun. It was more acceptable for boys to get dirty and play rough with each other. They played cops and robbers and capture the flag, while girls just seemed to sit and talk (usually about boys). Of course not all girls just sat around chatting – this just happened to be the group of girls that I was friends with. Now that I have my own child, I worry about her feeling limited by her gender. I worry that she won’t feel comfortable doing what she wants – because it is something that “boys” do. The world has changed a lot since I was young and gender roles have changed along with it – but those messages are still out there - the messages that tell children that if you are a girl you should like pink dresses and princesses…and if you are a boy you should like trucks and superheroes. About a month ago I went to a department store looking to buy Finley (my daughter) her first bike. Going into the bicycle section I was a little overwhelmed by how many bikes there were to choose from. I noticed a sign that was meant to help you choose the “right” bike for your child. The sign read, “How to choose a bike for a girl – girls want a bike that is pretty and fun.” Further down on the sign it read, “How to choose a bike for a boy – boys want a bike that is tough and can handle all their adventures.” That sign was sending a pretty clear message about what is expected of girls and of boys. (If you follow me on Facebook - https://www.facebook.com/ProfessorMom – you may have already heard that story). I was so upset by the sign that I immediately left the store. How is it that in 2013 we still have messages like these? Girls are pretty and boys are tough. Girls sit on the sidelines and boys are in the game – it reminded me of school days watching “wall ball” and wishing that I could play. So, as a parent – how do I teach Finley that there is no expectation on her to be pretty and sweet? It is not that I want her to reject all things feminine…I simply want her to know that it is her choice. It is not her parent’s choice or her friend’s choice – and not society’s choice either. It is her choice. She gets to choose how she wants to be in this world. If she wants to wear dresses and paint her nails, fine by me. If she wants to wear a blue polo shirt and play with trucks, fine by me. This can be difficult when society still thinks they have the right to define who you are by your gender. 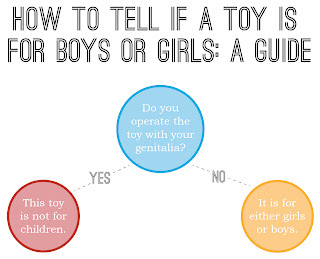 I saw this very helpful guide recently on how to choose the proper toys for girls and boys. Ok…seriously though. What can we do to support the uniqueness in each of our children and stop defining them by their gender? I have come up with a Top 5 list. 1) Choose toys based on your child’s interests, age and developmental level – not their gender. As the guide above so conveniently pointed out – toys are toys. They are meant for all genders. Do not limit your child to toys that are advertised for boys or girls. Let your children be involved in the process, you might be surprised at what they would choose to play with if they are not limited to “girls” toys or “boys” toys. *When you are shopping for things for your children to play with, avoid going to toy stores that have their stores divided by girls and boys toys (ex. Toys R Us). This just causes confusion and reinforces gender-stereotyping. 2) Avoid complementing your children on how they look, based on their gender. How many times have you heard someone say,“You are such a pretty princess!” to a young girl. Children love to have our attention and will soak up all the compliments they can. It is wonderful to compliment your children, but focus more on what they do as a posed to how they look. If we compliment them on how they look with phrases like the one mentioned above, this sends subtle messages to them that a girl’s role is to be pretty and sweet. If we compliment them on what they do, "Look at how high you built that tower" - it sends messages that they are capable and smart. 3) Read books and watch videos that show men and women in “non-traditional” roles. It is important that we as parents don’t reinforce gender-stereotypes by reading books and watching television shows that always show men and women in specific roles. If we read books where boys are the ones playing with cars and girls are the ones playing with Barbie dolls – we are reaffirming those messages that this is the expectation…really what we are doing is subtly programming them to act and behave a certain way based on their gender. A good book to read, if you haven't already is “The Paper Bag Princess” by Robert Munsch. 4) Choose clothes based on practicality and durability, rather than how “pretty” or “handsome” your child will look in them. This is a hard one, because society puts so much pressure on parents to dress their children a certain way. We want our children to look nice and of course we want them to “fit in” – but sometimes “fitting in” is more about “blending in” instead of standing out. We want our children to stand out – but not so far that they are teased or bullied. This can be a fine line. My advice…let your children wear what they want to wear. We always give our daughter a choice between many different outfits – some are more “boyish” and others are more “girly”. We don’t buy anything that is pink and frilly – nothing too over the top. Then we just let it be up to her. 5) Be aware of your own views on what roles men and women should have. This is a big one! I remember working at a childcare centre many years ago and there was a little boy there that loved dressing up. He would carry around purses and wear jewelry, and would often put on dresses and princess costumes. One of the days when he was dressed particularly fancy (dress, purse, necklace, long gloves and a crown) his father arrived to pick him up. Well, he got so upset that his son was wearing “girls” clothes that he started an argument with the teacher and said that his son was not allowed to dress like that. Seems a bit extreme…but we all have our own views about what roles men and women should have. Think about where those views come from and try not to impose those views on your children – unless your views allow your children to express themselves in whatever way they want…regardless of gender. That just puts the pressure on our children to change the views of our society. It is our job as parents to give our children the freedom to be themselves, dress how they want and play with whatever toys they like. I want Finley (our daughter) to know that she can be whatever she wants to be – and that she is in no way limited by her gender...she could even change the world! I tried to comment on this from my phone but guess my post didn't take so here goes again. I totally agree with you on all your points. My daughter loves to explore and play with insects and isn't in to playing with barbies or other dolls or doing "girly" stuff necessarily. We have never pushed her that way and have always let her play with and do what she wants to. I see my parents steering her towards the dolls and clothes that appear more geared towards girls however and in the bike they just bought for her with the Disney princess seat and helmet and shiny, sparkly streamers hanging off the handlebars. I can definitely see this as a generational thing but Paige doesn't really care about the bike because it is a bike..not because of whether it's pink or blue. The important thing is choice...letting our children have it as much as we can so they know that they are in control of what they like, who they are and the way they want to be perceived. All we can do is provide guidance and influence towards those things. Hi Mike! Thanks for reading my blog and for the great feedback. Choice is so important...for everyone, but especially for young children. The more choice that we give Finley, the less resistant she is to doing things that she really doesn't want to do (ex. Brushing her teeth). I think it is so great that you give Paige lots of choice and that you encourage her to be herself! Something I did when my kid was young was intentionally buy toys that were marketed to the opposite gender. So even though he naturally gravitated to vehicles and blocks, I also made sure that he had a kitchen set and dolls to play with. This was because I not only want him to understand that he has choices above and beyond what marketing executives have decided he should play with but also because I want him to develop into a nurturing, caring adult who knows how to cook and care for a family. The hilarious thing is that often they will sell the very same toy in two colours: One for boys and one for girls. How stupid is that? In the words of my best friend's five year, in rejecting the notion that pink is "for girls": "Colours don't belong to people". Yeah! Embrace the rainbow. Get yourself a power drill AND some cute barrettes. They are totally complimentary in my world. Well said Meg!! This is EXACTLY how I have envisioned myself raising our daughter; ie. Allowing her to choose her identity, rather than imposing one on her. Maybe we will all be on the same page one day, but it certainly isn't easy with all of the gender specific advertising still being directed at parents children. Like the father in your story about the boy who loved to play dress up in girly things, some parents are just not getting a clue that it's okay for their child to form their own identity. Thanks advertising.